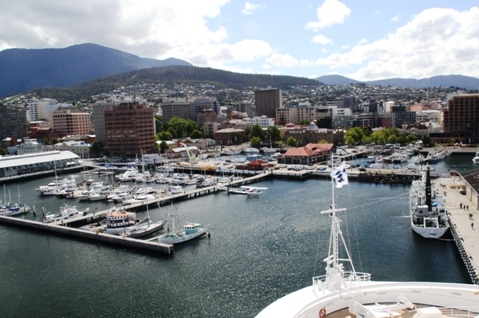 Our cruise ship docked in Hobart, the capital of Tasmania and second oldest capital in Australia. Hobart is nestled between Mt. Wellington, Mt. Nelson, and the Derwent River. A land bridge connected Tasmania to mainland Australia 10,000 years ago, but sea levels rose and land masses drifted, forming an island. Isolated by the Southern Ocean, Bass Strait, and Tasman Sea, rough seas discourage passage. As a result, the Aboriginal people were separated from European settlers in the early 19th century. When British arrived, they fenced Aboriginal lands and conflicts resulted. Today, no full-blooded Aborigines remain, but many people have Aboriginal heritage. The city’s history can be traced to 1803 when a small party of soldiers and convicts, under command of Lt. John Bowen, was dispatched from Sydney to establish a penal colony. Originally the town was located on the eastern bank of the Derwent, but later it moved to Sullivan’s Cove on the western shore, which is the current center of Hobart’s waterfront area. Geographically, Tasmania is closer to the equator than the South Pole. It’s a relatively small island and easy to explore on foot. There’s a water view from almost everywhere in Tasmania since there are thousands of lakes, even inland—some manmade for hydroelectric power and others natural from glaciers. No spot is more than 90 miles from the ocean. Only 129,000 people call Hobart their home town, and only 500,000 inhabit Tasmania, which is about the size of West Virginia. It’s composed of the main island, just four kilometers off the shore of Victoria, Australia, and 300 offshore islands. The eastern shore is warmer and has less rain than the western side because of Mt. Wellington, which is a cloud magnet. Interestingly, Tasmania sits on Austral-Asia Plate, so it is stable and doesn’t have earthquakes. Many well-preserved historical buildings, monuments, and cottages are still in use, primarily for government services. Try your luck at Australia’s first legal casino in Hobart. Known for outdoor adventure, visitors can participate in the Tahune Airwalk, whitewater rafting (Franklin, Huon, and Picton Rivers), or surfing big waves. Cheese farms in the north; vineyards, lush green valleys, tranquil forests, and a former penal colony are other attractions. Pick your hike: coastal terrain or mountains. 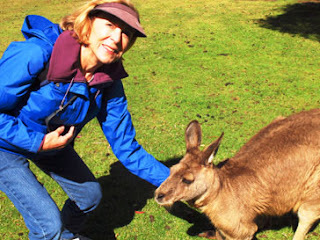 At Bonorong Wildlife Park, we had the opportunity to see a variety of animals such as kangaroos, Tasmanian devils, and wallabies. An Aboriginal word meaning “place of shelter” Bonorong started as a rescue center in the 1980s, a mission it still fulfills as well as education and tourism. Kangaroos roam freely in open space, and buckets of food are scattered around. Follow the staff’s advice to pet under the neck between the front legs, not on top of head, and you might get that dream photo. 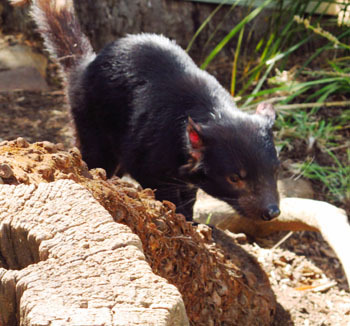 Don't mess with Tasmanian devils! We learned the Tasmanian devil’s bite is very strong, eight times that of a pit bull, and the ugly nocturnal animals emit blood-curdling screams that frightened early settlers. 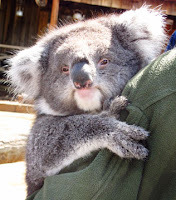 One of the staff cuddled a cute koala bear and another held a large, soft wombat--more fun picture opportunities. Koalas are cute and cuddly but not too social. Later, on the way to Richmond, a small town known for its rather plain and stoic Georgian architecture of the early 1800s, we took the Brighton Bypass on the banks of the Jordan River. When Aboriginal artifacts of trade and stone tools dating back 30,000 years were found, the design of the bridge was changed to preserve these artifacts. Fifty-five structures from the Colonial era are still in Richmond, including a bridge built in 1823 and jail (gaol) that later became an outpost. 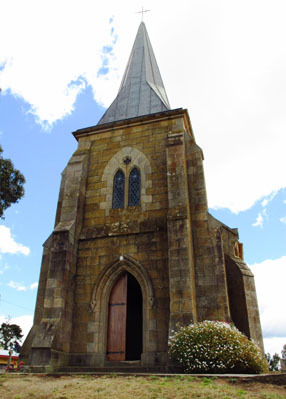 St. John’s Catholic Church, which dates from the 1820s, is the oldest church still in use for services in Australia. 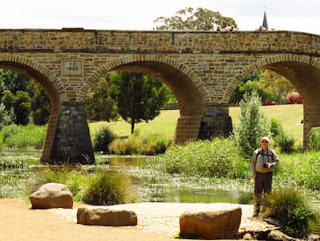 Because the historic past is actively preserved towns like Richmond are popular destinations in Tasmania. 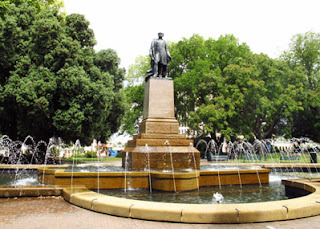 You have researched a lot about Tasmania and it is been great feeling reading your blog! Providing services in Tasmania, we just love everything about Tasmania!